Happy Friday Everybody! 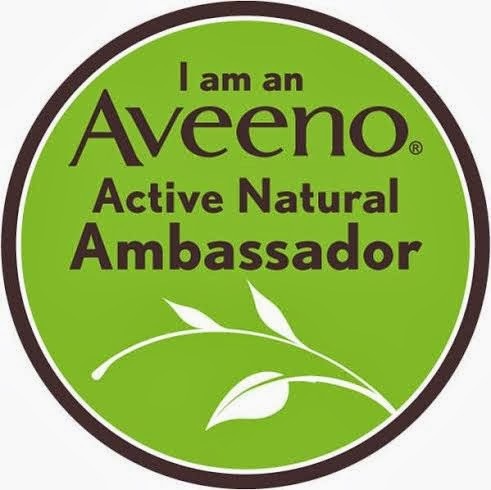 I'm excited to announce, that I am a 2014 AVEENO® Ambassador. I'm honored to have been asked and I look forward to all of the wonderful opportunities this collaboration will bring to myself, blog and readers. This venture is new and exciting to me. I look forward to sharing my journey with you. January is National Oatmeal Month! Since 1937, the AVEENO® Brand has been utilizing the moisturizing and soothing properties of oatmeal in their products. So, as you can imagine this makes National Oatmeal Month one of their favorite months. I'm a big fan of oatmeal. My grandmother and mother always gave me a warm bowl of oatmeal for breakfast as a child. I still eat oatmeal today and truly believe in it's overall benefits for both body and health. 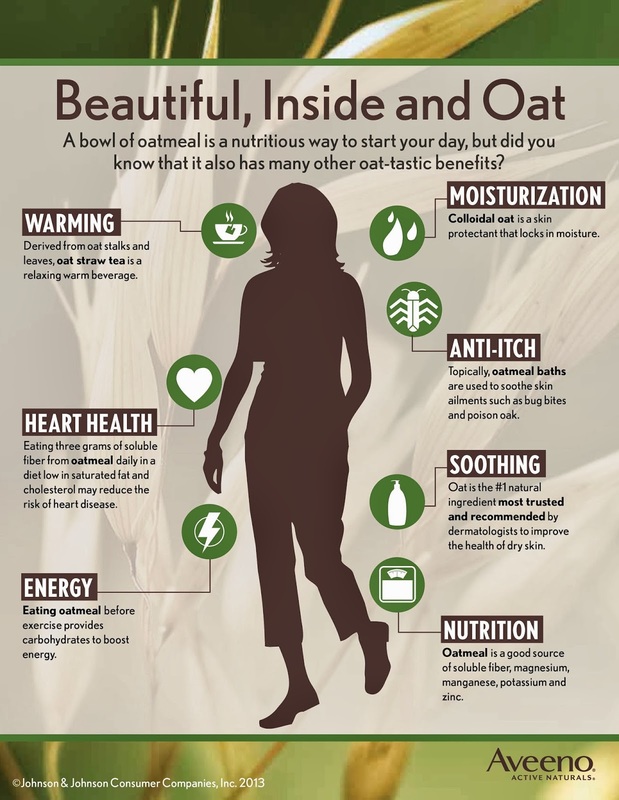 The infographic below shows oatmeal's amazing benefits. January is National Oatmeal Month! Since 1937, the AVEENO® Brand has been utilizing the moisturizing and soothing properties of oatmeal in their products. Start your day off right! 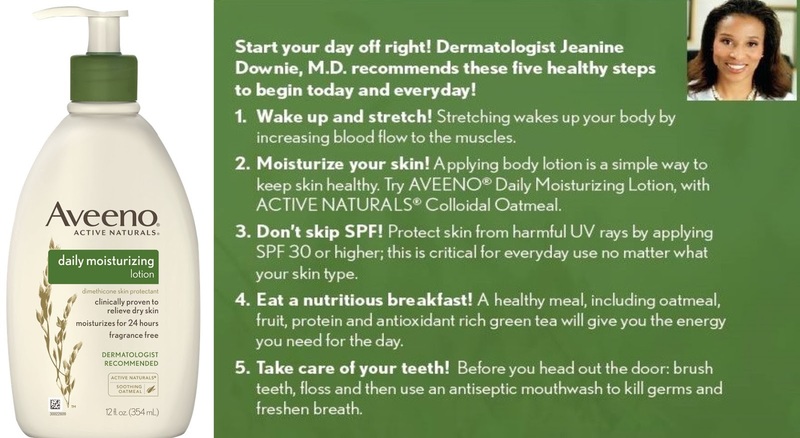 As we start the new year, let's practice these 5 healthy steps as explained by dermatologist Jeanine Downie M.D. I personally need to work on #1 & #3! S-T-R-E-T-C-H-I-N-G sounds nice. I usually just lay in bed a few minutes and then start my day. Does anyone else forget to wear SPF? I often forget to use it in the winter. I'm really good at applying it during summer months, so I must work on that. 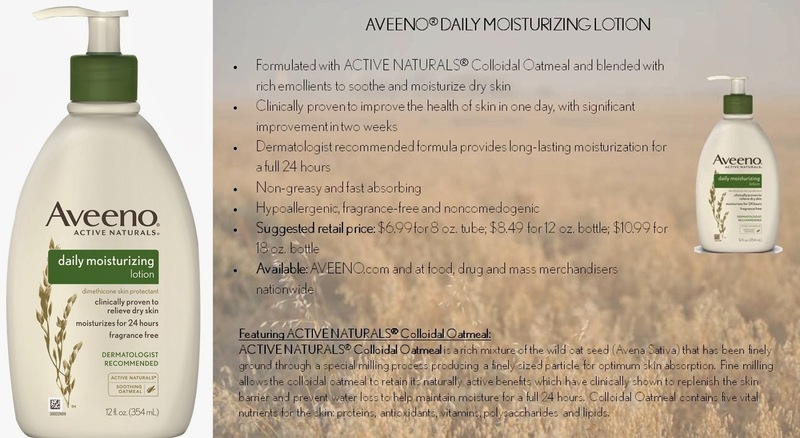 AVEENO® daily moisturizing lotion! This nourishing lotion contains ACTIVE NATURALS® Colloidal Oatmeal blended with rich emollients to moisturize your skin for a full 24 hours. It is clinically proven to improve the health of skin in 1 day with significant improvement in 2 weeks. Formulated to help prevent and protect dry skin, it leaves skin feeling soft, smooth and naturally healthy-looking. It is gentle enough for everyday use, fragrance free, nongreasy, and noncomedogenic.(source). 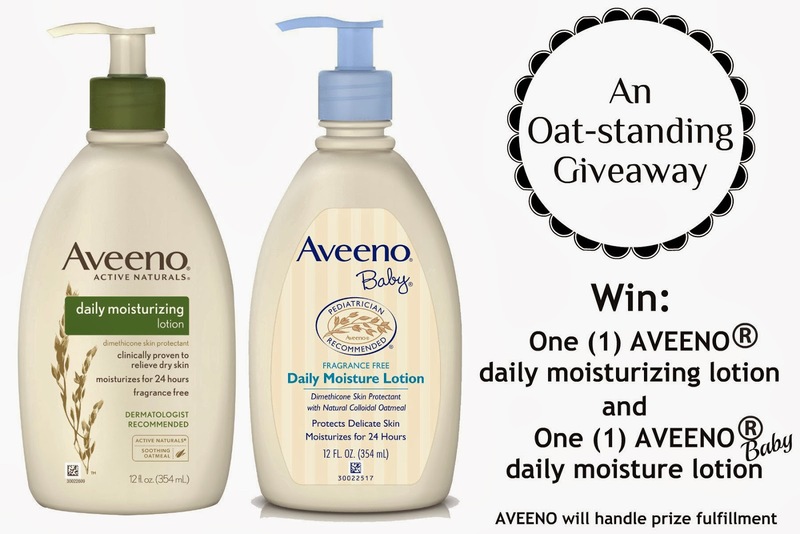 AVEENO® would like to give one (1) of my readers a chance to win their AVEENO® Daily Moisturizing Lotion AND AVEENO® Baby Daily Moisture Lotion. Please use the rafflecopter widget below to enter. US residents only. This collection features ACTIVE NATURALS® Colloidal Oatmeal, a rich mixture of components found in oat seed, which work to nurture and replenish the skin barrier while preventing water loss to help maintain moisture all day long. This wonder ingredient contains five vital nutrients for the skin: proteins, antioxidants, vitamins, polysaccharides and lipids. Hello Kim. Congrats! I'm an avid user of Aveeno. Love their soy daily moisturizer. I'll have to enter the giveaway. I have to confess I don't do all of those 5 steps in the morning either - even in the middle of summer, if I'm just going to work I only put sunscreen on my face. i think it's a great brand and products! nice blog! shall we follow?bloglovin? Congratulations Kim, what a great brand to work with. Oatmeal is great for both tummy and health. I have had good result from Aveeno years ago when I broke out with Ezema and nothing worked (pure shea butter included). Went to a dermatologist and he recommended a special formula of Aveeno, worked like a magic. Congrats on becoming their ambassador! I LOVE the Aveeno lotion, it is great in the winter when my hands are dry. Congratulations Kim! What an amazing opportunity! Aveeno has wonderful product line and oatmeal has awesome skin benefits. I use a paste of oatmeal and baking soda when I get skin rashes. Thanks for another awesome giveaway! Nice giveaway! The winner will be very happy! For lotion, I use Eucerin because it's the best for my skin, but I love using Aveeno as a face wash and moisturizer! I love aveno... All their products are so gentle on your skin! Oh this was great to read! I am trying to get into different products for my skin, so I will have to check them out on my next trip to the store. Congrats Kim!! I love Aveeno. My son has mild eczema and it works really well! I love Aveeno lotion, such a rich and feel good after applied. I love Aveeno and it is so great a giveaway for all US readers, I wish them all the luck! You are such a great blogger that this opportunity is well deserved! lovely giveaway :) I've never used this brand. this is so awesome, Kim!! Congratulations Kim! Looking forward to your posts and reviews about Aveeno products. I love oatmeal too. I resolve this year to eat healthy by setting oatmeal for breakfast. Congratulations! I love Aveeno products, but often forget to wear my SPF. I really need to work on that! Congrats on the Ambassadorship Kim! Aveeno is a great product and a favorite of many. Amazing review product! I wanna try! I haven't tried many Aveeno products except for their eye cream but I've heard really good things about their hand creams and moisturisers, particularly from missglamorazzi. Those tips on how to kick start your day definitely sound like things I should be carrying out ... especially the SPF and nutritious breakfast! Never heard of these products. Oh wow all this info is good know, I eat oatmeal 6 days a week! Yes I like Aveno products and have used them in the past. And it's funny just HOW great Oatmeal is for you! I didn't realize it was Oatmeal month! That is amazing! Congratulations on your position! I have yet to try Aveeno yet I have heard of how great it is! I love Aveeno, this brand saved my skin a couple of times already, once it went all itchy and altered because of a wrong product and I was put on Aveeno routine and it worked so well ! Congrats my friend. Also, I entered the giveway! I love their products. aveeno have a very nice product! This a quality brand and products! im following you now on g+, bloglovin' and gfc! Congratulations on becoming an ambassador Kim - it's well-deserved! I will always have a soft spot for Aveeno oatmeal products (no pun intended! ), they were so soothing when I got the chicken pox... I was seventeen and the whole experience would have been torture if it hadn't been for Aveeno oatmeal baths! Have a good new week start :). Thanks for sharing Kim - who knew oatmeal had so many amazing benefits?! Congrats - you are a perfect ambassador! My mom loves Aveeno as well and this is a fab giveaway! aveeno makes such awesome products for sensitive skin. i swear by them, esp in these winter months! Congrats Kim!! I know I said it on IG but I wanted to tell you again. I'm super proud of you!! Congratulations on being ambassador! I'm so proud of you. I didn't know oatmeal had so many benefits.